All Reiki Channels Welcome! Includes tea, coffee and nibbles. Glenyss has been a Reiki Master for 20 years and will hold a question and answer session at 1.00 p m prior to the Reiki Share. Please, come along and enjoy the warmth and connection of being in community with others of like mind. A Reiki share consists of many healing hands on one person at a time. One person lays on a table while the participating practitioners gather around that person, laying their hands upon him and facilitating a massive flow of Reiki energies. Group energies are often very strong and can be more powerful than individual sessions. The energy produced during a Reiki share is amazing and the healing people experience can be profound. Sanctuary Angel Gallery is the perfect environment to participate in Reiki. 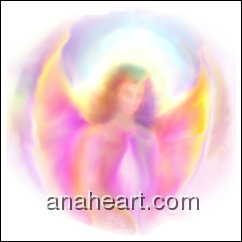 You will be surrounded by the high vibration of inspirational Angel Artwork by Glenyss, in an atmosphere of peace and harmony. Pay with PayPal or book with Glenyss 0438786484 and pay on the day. Yesterday when I opened Sanctuary Angel Gallery I was carrying an armful of stuff and left the front door ajar. When I came out of my office to my surprise I found I had an early visitor. 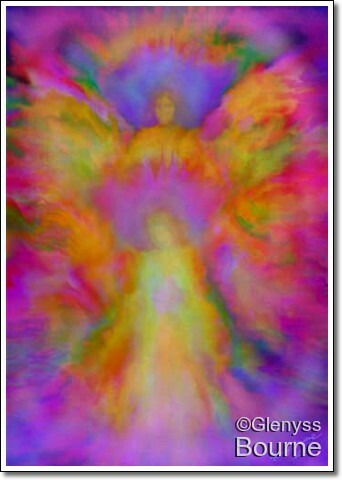 The Magpie was in the lounge area calmly walking around looking at the Angel paintings. After a good look around I opened the back door and she went out the back door for a late lunch. My phone was flat so I could only get a photo. I hoped she would come back tomorrow when I could take a video. 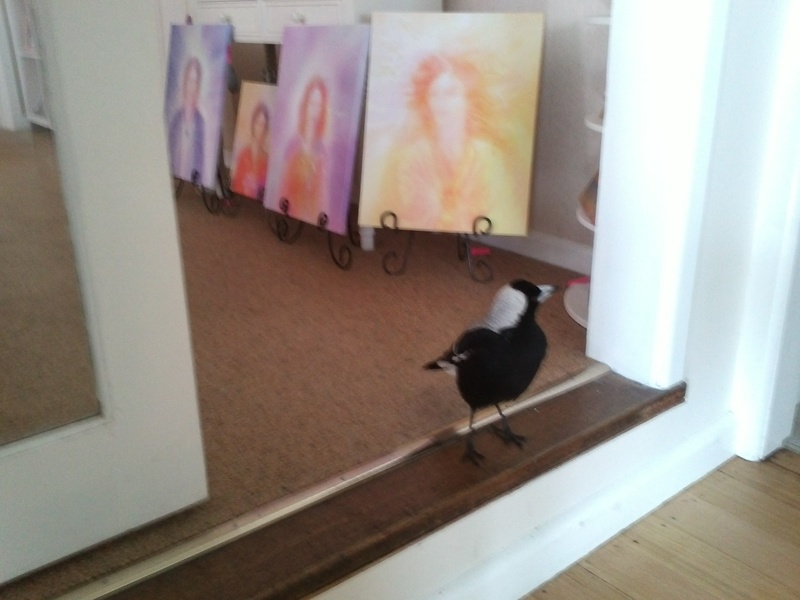 She loves the high vibrational energy at Sanctuary Angel Gallery, and has come inside a few times in the past, usually when I have left the door ajar when I open up; but I haven’t seen her for a few months. She visited yesterday and was waiting for me to arrive today and as you can see she was really keen to come inside. I don’t feed her regularly and have not trained her in any way, she just loves the healing energies! Her favorite paintings today seemed to be Jeshua, Sananda. Archangel Michael and Deep Waters. As I arrived at Sanctuary the next day I saw that Maggie was already waiting for me, and again she came inside, calmly looked around and left. After I had opened all the curtains and got ready to open the Angel Gallery. I heard something at the front door. It was Maggie and some of her friends! They sang at the door until I let them in. I couldn’t let them come right inside as I had opened up the curtains and it can be dangerous as if they get a fright they can panic and try to fly out of the closed windows and hurt themselves. I decided to let them in the porch. This is the video of their visit.